Much cooler and overcast weather today in Utah. Feels a little more like fall. With that it is time to start adjusting the amount of water being put down in the pumpkin patch. Two days ago I decreased the watering by about 3 minutes per zone (about 10% less water). Will move that up and down according to the temperatures, but the pattern lately has been warm days (low 90s), but it has taken much longer for it to get up to 90 degrees lately because the nights have been cooler. That means the plants need less water. The overcast, higher humidity weather also means more problems with powdery mildew. I sprayed the leaves with Rose Defense II which is a fungicide/insecticide. I also did a foliar application of nitrogen, phosphorous, potassium, kelp and yucca. Tomorrow it will be three weeks from when I cut the 747 pumpkin from off the vine. Want to get everything out of that plant that I can. Today I put down some RAW Microbes (mycorrhizae + baciillus), Actinovate, azos, cane molasses and a touch of liquid seaweed on the pumpkin plants. Those little guys will help to protect and feed the plants. Did a measurement on the 747 pumpkin this morning. Average weight gains were up a little from from the last measurement. That either means one of the two measurements weren't very good or the hot weather we had over the weekend affected growth, but things are doing a little better now. If you are one of the people that reads this blog everyday, it may seem redundant, but I spayed some nitrogen, potassium, humic acid and yucca on the soil this morning. I literally put everything I do when growing giant pumpkins into this blog. It is rare that I'll not put something and usually if I don't put it in the blog it is because I forgot or I'm doing a test that I want to try before making it public and I always eventually put it in the blog after the test is over. The other reason everything is posted here is simply for myself. 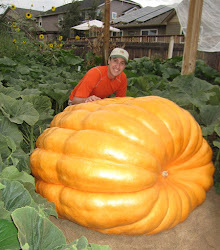 I love sharing tips on growing giant pumpkins, but I also read this blog myself. Why you ask? Isn't this blog boring enough to put anyone to sleep during a second read? Well, yes, but sometimes I'll look over the previous few posts to remind myself what I've done with the plants recently because I can't exactly remember when I sprayed something like TKO and I don't want to spray anything with copper in it for at least 10 days after. Color between the two pumpkins are obviously different. Papa was more yellow than orange so this pumpkin is kind of a hybrid of the two. I've drawn some lines, on both pumpkins to highlight how the ribbing is similar between the two. Mam has that funny looking ring around it. That was due to irrigation problems, but the shape of the two pumpkin are the same. Generally speaking this pumpkin looks a lot more like mama than papa, so hopefully it will go heavy like mama. I don't expect it to go nearly as heavy however. Pumpkin growing can sometimes be a head game. It can be hard to be patient, when you want a big pumpkin. I'll use the blog to help remind me that things are growing and everything is all right which I know has helped me at times from over reacting and doing something that I might regret later. Did a soil application of NPK Grow 7-4-5 this evening on all of the plants. Got kind of warm today. Low was somewhere near 48 degrees and the high, according to my temp gauges was 101. This morning, I sprayed the rest of the cal/mag, Omina, potassium, humic acid and yucca that was left in the sprayer from two days ago on the soil and then I sprayed CalCarb on the leaves. Temperatures are going to heat up some over the next few days and the CalCarb will help the leaves some with the heat stress. Did a five hour brew of compost tea and then mostly poured the five gallons on the ground and on some of the leaves. Tried to focus on the established, but newer growth areas of the plant and around the stumps. Those areas of the plant with the full-sized but newer leaves are going to power the pumpkin through the remaining month of the season, so I want to baby those sections of the plants and get as much out of them as I possibly can. Trying to make every day account for 10-12 new pounds on the pumpkin as long as we can. Never know in these parts when a frost will hit. Forecast looks really good for the next 10 days, but the average first frost in Midway is around September 15th. We'll hope for a warm end to the summer and first two weeks of fall. This evening I sprayed a fairly hardy fungicide on the 747 plant to help try to control the powdery mildew that is plaguing it. After that I sprayed on the soil cal/mag, Omina, potassium, humic acid and yucca. One thing you have to watch for on your pumpkin this time of year are splits in the skin, stem and blossom end. Season ending splits typically start inside the pumpkin and work their way to the surface and there isn't much of anything you can do about those. However, scrapes on the skin and growth splits on the surface typically aren't season ending. Particularly if they are taken care of early. A 10% solution of bleach on the damaged area or some sulfur powder is what I typically use to take care of these and it almost always works. If the damaged area is left too long however without treatment it sometimes will begin to rot. If that rot gets past the surface, your season typically is done at that point. Sometimes you can scrape the rotted area away and then heavily treat the damaged area (50% solution of bleach + sulfur + keep the area dry), but often times it can be very difficult to stop it once it starts rotting. Sometimes some pumpkins will sap as they grow. Basically as the pumpkin grows "sap" from the pumpkin gets pushed out of the skin. The sap looks like sap from a tree and is light yellow to reddish in color. Typically I'll give those areas a spray of bleach, but usually they aren't a problem. If anything it indicates the pumpkin is growing, because I've never seen a pumpkin sap that isn't still growing. Sprayed RAW Grow 7-4-5 on the soil this morning for all of the plants. An ideal, everyday fertilizer, in very small quantities for a pumpkin plant, depending on the time of year, would be something like 10-5-10. Lower phosphorous because it can build in the soil relatively quickly, but also to keep things like myco happy. However, there are times I believe, later in the season you can go a little higher. This evening I gave the plants a small foliar application of 3-12-12 with some seaweed, humic acid and yucca in it. Like I mentioned previously, my last month of growing typically has not seen the weight gains that I think I should have got. This year I'm going to do a little more fertilizer for the last 30 days and see what that yields. This means feeding 5 times a week with small quantities to keep the plants going. Most of this will be applied to the soil. This evening I sprayed Organicide on the leaves. It is basically neems oil. It is an organic insecticide and fungicide. Not great at either, but it can kill biting bugs like mites and will slow down powdery mildew. I like to rotate when using heavier stuff, when I need to. In the morning I did a light soil application of potassium, fish, fulvic acid and yucca. In the evening I did a foliar application that was mixed with the Organicide. Below are photos from the patch. The 747 "Jumbo" pumpkin has already exceed estimates I had earlier in the season for where this pumpkin would end up. If she keeps growing a little and if she doesn't blow up and if she goes as heavy as mama did, then it will end up being the biggest pumpkin that I've gotten to the scale that wasn't damaged (but that is a lot of ANDs). Mama for this seed was 19% heavy. Papa got a blossom end split and never made it to the scale. The shape of this pumpkin is just like mama however, but that doesn't always mean anything. My two biggest pumpkins I've grown in the past had holes in them, but managed to keep them together so I could get them to the scale. My personal best pumpkin was 1,220 pounds. Jumbo has no shot at being that big, but could end up better than anticipated. The 1685 pumpkin is under wraps (literally). I've not measured it in some time. Still growing! Gave the plants a small amount of granular 22-0-0 and humic acid. I think that a close second to working hard in the pumpkin patch is doing your research. There is so much to learn in order to grow a giant pumpkin and getting the RIGHT information is very important. There is a lot of bad information out there. Even on bigpumpkins.com. I've even talked with growers who had grown world record pumpkins who shared a piece of bad information. The problem is that there is more to know than anyone could consume and new research changes old ideas all the time. So I believe that Google and the word "study" are two of your best friends. When I want to do a search for information on "alfalfa triacontanol root mass" because I want to learn how alfalfa can help build root mass, I like to add the word "study" to the end of the search. Try searching for "alfalfa triacontanol root mass" and "alfalfa triacontanol root mass study" and see how it changes the search results. The first is more general so you get the marijuana growers posts (some very knowledgeable growers in that group and some real idiots), scientific studies and products marketing their benefits. The problem is that anything other than the scientific studies can be old wives tales and marketing hype. The science isn't always right, but I'll take it over someone who may have started growing last month and is throwing out comments in a post. I own a website design business that does SEO so these kinds of tricks are the types of things we use all the time to get websites to rank on Google, but these same techniques work well for someone who wants the best information to grow a giant pumpkin. I gave both plants more compost tea today. I wish I had put down more compost tea early in the season. Since this is a new patch, it could have used it to build up the biology. Usually when the plants in the hoop houses most of the watering I do is with compost tea. This year I almost did none. One challenge with giant pumpkin growing is time and this year I haven't had it. The new house has demanded a lot of time. I don't even have my watering system in the patches. Both plants are watered by a single impact sprinkler that I move around from time to time. The little details add up to hundreds of pounds. I knew that this year was going to be a re-learning year, so hopefully I can put in some more time next year. I high tunnel is in the works for next year, so it might not be the year either. Will depend on when that comes together. Today's compost tea brew was a short brew. I added in some beneficial bacteria and fungi into the brew to help beef it up. Along with that I added cane molasses, alfalfa, compost, silica, humic acid and kelp. That was poured over the leaves and around the stump and main vine on both plants. It should help protect and feed the plant. What I've been doing seems to have slowed down the powdery mildew. That first week of August it hit hard and fast. It doesn't seem to have progressed a lot since, but if we get a cold spell there could be trouble. The 747 pumpkin (aka Jumbo) is at 72 days old now. 90-100 days about how long most pumpkins will grow. A good one might go 110 days, but typically not more. I did a measurement on my pumpkin today and growth has dropped 6 pounds a day as compared to the week prior. I'm hoping that is somewhat because I believe the pumpkins didn't get watered for two days while I was gone. The timer was all messed up when I got back and the soil was relatively dry, so I think that might have been the case. We'll check again in a week. But at 72 days you can expect growth to slow down a fair amount. Late season growth can make or break a season. Some pumpkins are hares. Some are tortoises. But in the end, all that matters is the final weight on the scale. Like I mentioned before, I've been trying to fertilize more this season. I think I've under fertilized in the past. Next season I'll probably increase my fertilizing even more. Matt McKonkie fertilizes every day. This is small spoon feeding, but enough to keep the pumpkin growing and never be deficent. In the past, my September growth has been poor. I thought it might be weather, which is a factor, but now I think it has more to with the plant bonking because it has used up much of the nutrients int he soil by late season. Today I gave the plants NPK Potassium, Omina, Cal Mag, humic acid, cane molasses and B-vitamins. That was mostly put on the soil. Matt made told me he doesn't put anything on the leaves (i.e. no foliar feeding) because he thinks the leaves aren't really made to bring in nutrients and it damages the leaves. I think I'll still foliar feed, but do it less frequently. If something potentially is locked up in the soil then foliar feeding is the best way to fix it, but I'm going to reduce how much I foliar feed next year. I expected to see some very big pumpkins on Saturday at the UGPG patch tour, but was blown away by what I saw. All of the patches looked great, but there were two obvious standouts on the tour. The first was Gordon Tanner's giant squash. Not sure what the growth rate is currently on it, but it was in the ballpark for becoming a new world record if it can keep growing like it has in the past. Taped over 1,100 pounds and it probably was the biggest greenie I've ever seen and it still has over a month to grow. I know this is already bigger than any pumpkin Gordon has ever grown, so congrats to him already. If he can get it to the scale, I'm sure he has a Utah record breaker in his patch. The next stop was at Matt McKonkie's patch. He didn't grow last year and obviously has put two season's worth of energy into this year's patch. His pumpkin, grown on a Wallace seed, isn't quite the biggest pumpkin I've ever seen yet, but within 100 pounds of it and still has 30+ days to grow and still putting on 20 pounds a day. 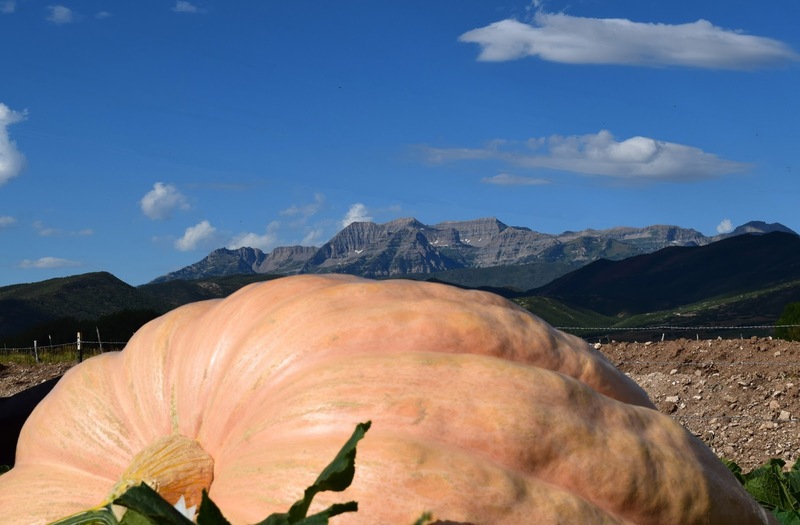 At 78 days old and an amazing 1,900+ pounds, it will be interesting to see if the pumpkin still has enough in it to grow all the way to the Thanksgiving Point way off. The plant looks healthy and happy. Pollinated the very end of May, the fruit would be 116 days old by the time he takes it off the vine. I wouldn't be surprised if he could get growth on it for 110 days. 116 days might be pushing it. So for fun, some quick "what if" calculations. Let's say the pumpkin will grow for 110 days. And with the growth curve, the pumpkin can put on 7 pounds a day. I don't want to jinks anyone, but that would put Matt's pumpkin in the World Record range at 2,670ish pounds, if the pumpkin went to chart. Thanksgiving Point should be interesting. This evening I sprayed on the soil some NPK Grow (7-4-5) with a touch of potassium and and yucca added to it. The yucca in the soil helps water penetrate more evenly and deeper into the soil, allowing for greater root mass. This evening I sprayed on the ground a liquid iron/sulfur fertilizer. It also had micro amounts of zinc, copper and other nutrients. Iron is a very import nutrient for plants. It is in the process of making chlorophyll. It is also involved in making of most of a plants enzymes. A plant doesn't need a lot of iron to grow healthy, but too little will cause chlorosis which shows up as yellow leaves. The elemental sulfur will help drop soil pH. My pH is too high, like most western soils. As bacteria in the soil break down the sulfur an acid is produced, which helps drop the soil pH and more nutrients can become available to the plant. I've haven't used as much compost tea on the pumpkin plants as I would typically do this year. Yesterday I started a brew that I applied this evening. It had compost, alfalfa, Actinovate, humic acid, silica, cane molasses, milk, NPK Bloom and a touch of kelp in it. After aerating it for 24 hours I spread it across the leaves of the plants and in the stump area. That should help fight off the powdery mildew and build the biology that will feed the plants. I once watched an interesting video that talked about how adding cane molasses later in the season to the soil can help boost yield by keeping the microbes in the soil going. Pumpkin plants and beneficial bacteria and fungi have a symbiotic relationship. I think most competitive giant pumpkin growers see the value in putting down myco in the soil to increase root mass, but maybe more importantly have the myco bring back nutrients and water to the plant. The way this symbiotic relationship works is the microbes feed the roots and the plant roots give back sugars to the microbes. The problem becomes that later in the season, when the pumpkin is putting on pounds, the plant can start to get stingy giving back the sugars to the microbes. As a result, some of the microbes may die off or become less productive. This is because the plant has most of what it needs and wants to feed the pumpkin. In order to keep those microbes growing and working for the plant, a good strategy is to put down some cane molasses on the soil. 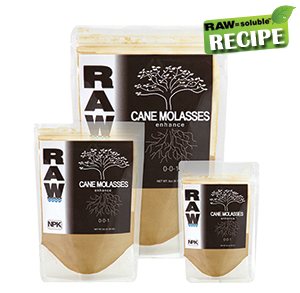 RAW Cane Molasses will feed the microbes and help build beneficial bacteria in the soil. It is also very easy to use and mix. Today I put down NPK Microbes Bloom & Grow formulas with a some Azos and RAW Cane Molasses. I sprayed it under the canopy onto the soil and then took a watering pail and poured some around the stump areas of the plants. After that I watered it all in by running the sprinklers for 10 minutes. This first pic is a picture of the "bird bath" that the 1685 "Cujoe" pumpkin has. One small spot was looking a little suspect for rot so I wiped the whole birdbath area with a 50% solution of bleach, then I put sulfur powder in it. That should take care of it. I also have a tarp to cover that pumpkin now so it won't fill full of water each watering. A couple of days ago I noticed that on the 747 pumpkin I was having problems where the pumpkin was pressing up against the main vine and pushing it out. Poor vine maintenance. I didn't do a good job in putting an S curve in the vine and as a result the pumpkin had grown into the vine. With time it could have snapped the stem off the vine. Thanks to a good neighbor who helped me pull the pumpkin back. Tried to do it myself but it wouldn't budge. Could just verily move it with the two of us. We should be in good shape now however. Were able, with a number of tries, to get it moved back and inch. I mentioned in a recent post that I've got some powdery mildew going on in the pumpkin patch. After returning from vacation I noticed it and now that I've had some time to get into the patch more, it is relatively bad for this early in the season. The interesting thing is that the 747 plant has it bad. The 1685 plants show none. I've seen this before. Some plants seem more resistant than others to powdery mildew. The other thing is that the 747 plant got much more beat up by winds than the 1685 plants and that damage makes it more susceptible. All of the older leaves that survived the wind were covered in powdery mildew so I took them out of the patch to help keep it from spreading. The leaves that are a little younger but damaged are also showing relatively bad powdery mildew and I'll have to take those leaves out in the next couple of weeks. Getting the powdery mildew this early and this bad is bad sign. I'll have to manage it carefully or I'll have real problems in a month. Today I hit all of the plants with a fungicide and a insecticide/fungicide. Last night I put down some organic granular fertilizer (8-2-1). It is a slower release fertilizer. I also sprayed on the soil some potassium, humic acid, b-vitamins and Omina. The grandular doesn't have enough potassium and the pumpkins are feeding heavily on potassium at this point of the season so I want to keep the supply up. May have overdone it some on the nitrogen this week, so I'll back off on it the next couple of weeks.